If you think about it, men are a lot like spiders — they have eight legs, are emotionally unavailable and can be a pretty chill hang. 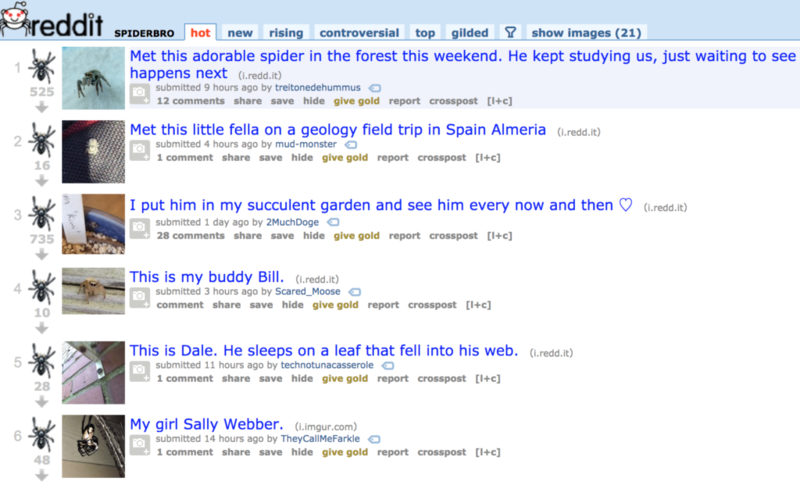 So it makes perfect sense that a dude created r/spiderbro, a subreddit devoted to chill spiders who are on our side, and the low-key enthusiasm they inspire. It’s a gentle place where people are gently excited, gently appreciative and gently respectful of spiders just doing their gentle spider thing. It’s an important corrective to the Misunderstood Spider, a meme about common house spiders who just want to be your pal and eat undesirable insects for you but instead are constantly being killed off by you and your dimwitted family. At r/spiderbro, no such misunderstanding exists, and spiders are held in the highest possible esteem — that of guardians and that of friends. They protect us. We protect them. Simple. Comments chime in respectfully, and enthusiastically. Of course. His name is George, in fact. Another spider who makes an appearance, Dale, sleeps on a leaf that fell into his web. Elsewhere, spiders are bragged about on the site as an “absolute unit” or a “stunning bro” to check out. Such fawning is, of course, anathema to the spider reputation in most of the world, where outside of Charlotte, the unwitting star of Charlotte’s Web, they are vicious, callous creatures. Here, spiders are not just cool and chill, they even offer a protective spirit to man’s castle. “I mean, you were CLEARLY asking for a high-five, and a bro won’t leave you hanging!” a fellow redditor commented. Being chill and useful and never leaving a fellow bro hanging? Why, it’s just the spiderbro way. Spiderbro creator and moderator Agnostix says that’s exactly what inspired him to start the forum. That was four years ago, and in the intervening years, Agnostix believes strongly that the forum has helped dispel some myths. “It has helped people overcome arachnophobia and realize that spiders play an important role in our ecosystem,” he says. That pleases Rod Crawford, a spider expert and curator of arachnids at the Burke Museum in Seattle. He’s used to dispelling numerous fallacies and myths in the opposite direction, which he routinely blogs about at the Burke Museum blog. People think all spiders make webs (they don’t). That they all have eight legs (they don’t). That arachnid refers only to spiders (it doesn’t — a scorpion is an arachnid; so is a tick). I ask him about the image of spiders as offering some kind of protection to us. While it’s refreshing to have people finally think of spiders as less scary, he says, it’s not exactly a mutual feeling with the spider. However, what they are — and what r/spiderbros’ creator and its followers understand — is extremely important to our ecosystem, as Agnostix notes. What they also get right at spiderbros is that you really shouldn’t be afraid of most spiders you encounter. You might not want to pick up a brown recluse or black widow, Crawford says, but neither is going to go out of its way to bite you. That fits perfectly with the r/spiderbro philosophy. You don’t need to go fist-bumping your spider pals — just wave as they go by. Appreciate them. Even if you feel so keen on spiders that you imagine them to be your friends.